The chaos that marred Heathrow's Terminal 5 on its opening day, leaving many stranded overnight, "was not our finest hour" BA's boss has admitted. British Airways' chief executive Willie Walsh accepted the debacle had affected the reputation of BA and of Britain. 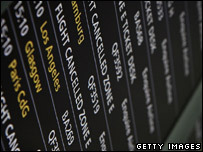 More than 100 flights were cancelled on Thursday and Friday with another 54 flights on Saturday cancelled. Airport operator BAA said it was working with BA to resolve the severe baggage problems. A BAA spokesman said: "BAA's first duty is to passengers and airlines. "Today at T5, we are focusing all our efforts on our work with British Airways to resolve baggage issues and to deliver a good service to passengers. Elsewhere at Heathrow, our terminals are working normally." Mr Walsh said the situation was improving on Friday, but admitted the opening was not a success. "We clearly disappointed a number of people and we sincerely apologise." He said a "combination of factors" that they had been unable to "get on top of" had led to the disruption. He told BBC Radio 4's World At One programme that if one of the numerous hold-ups - including staff car-parking problems, staff security screening and baggage delays - had happened "in isolation", then the resulting travel chaos would not have been so severe. He described the baggage delays as "minor system problems" and said that as the system had undergone six months of testing "we should absolutely have done better". "In isolation some of these problems were identified and we felt they had been addressed. There were some basic human errors made that compounded the problems." Late on Friday the airline cancelled 54 flights to and from Heathrow on Saturday, while 293 flights remained on the schedule. It followed the cancellation of 36 of Friday's flights from T5 and 36 to the terminal. Passengers could now check-in both hand and hold luggage. The airline, which has sole use of T5, says it has drafted in extra staff and held meetings through the night to try to ease the problems that wrecked the terminal's first day. Earlier in the day BA announced that "initial teething problems" with car parking provision, delays in staff security screening and staff familiarisation had resulted in a backlog of baggage. Sources have also told the BBC that morale was low among staff. "BA claimed 'staff familiarisation' was to blame. The staff, however, would blame the lack of training and the essential support that was promised," he said. BBC reporter Steve Rosenberg said on his flight from Berlin to Heathrow the captain warned passengers that "things haven't been going well at Heathrow, so keep your fingers crossed". On arrival, there was a delay while ground staff were found to help park the plane, and there was no bus driver available to collect the disembarking passengers. Once at the terminal door, there were further delays as a swipe card used to open it would not work. But our correspondent said his bags came through on the conveyor belt promptly. David Frost, director general of the British Chambers of Commerce, said the "shambles" had sent a "depressing message to businesses around the world". "This is a PR disaster at a time when London and the UK are positioning themselves as global players. We can only hope that this will provide a wake-up call as we gear ourselves up to host the Olympics in 2012."